Helen, or Eleni as she is known locally, was the mother of Emperor Constantine, of Constantinople fame. While on pilgrimage to Jerusalem she dreamt that building a bonfire would reveal the location of the crosses Jesus and the two theives had been crucified on, which had been buried and lost. This she duly did, and the column of smoke from the fire curved down and touched the ground at the place the crosses were buried. In order to figure out which of the three was the True Cross, a deathly ill woman touched each in turn until she was miraculously healed. After that the True Cross was apparently hacked to bits by religious souvenir hunters as there are pieces of it kept as relics in churches all over the place, including Ethiopia. Another key part of the festivities is the building and lighting of bonfires, called demera. 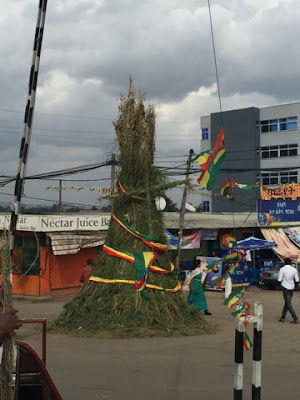 There's a big one in Meskel square but also smaller ones all over the place set up by families or neighborhoods for their own celebrations. They are traditionally decorated with small yellow daisies known as Meskel flowers and set alight as part of a feast with music and dancing. I went to one with some friends and it was a lot of fun. 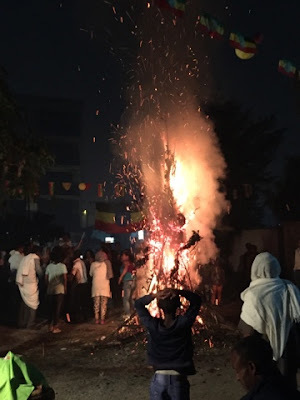 I sampled some homemade tej, or honey wine, attempted some Ethiopian dances (much to the amusement of the assembled guests), and carried a torch to help light the fire. I love holidays!